VERTEX PISTONS PRESS RELEASE: Our customers have been buying and enjoying Winderosa’s industry leading gaskets for years. This legacy of top-notch quality and selection now continues under the new brand name, Vertex. For over 65 years, Vertex has been known for their race winning and OEM quality motorcycle pistons. And now, in addition to pistons, Vertex will become the new leader for gaskets in the powersports industry. You will notice that our packaging has changed, but the same great quality gaskets that you found with Winderosa are now listed under the Vertex brand name! 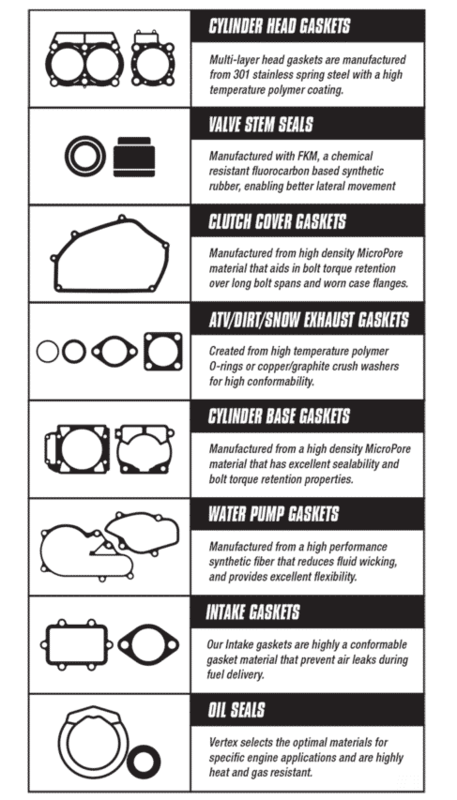 VERTEX GASKETS ARE NOW AVAILABLE!